Themes Kingdom have created a beautiful portfolio theme with their Eris WordPress theme. There are hundreds of great ‘minimal portfolio themes’ available and whilst Eris falls into this category it still manages to feel different. This is down to the attention to detail the Themes Kingdom team have. The typography is very clean and simple, the use of white space is spot on and there are some nice animations that add some flair whilst being subtle and non invasive. All these features combined mean that your work is able to stand out and your website is easy to use. We’ve all seen the popular portfolio websites that everyone seems to copy these days with their garish animations, parallax, stats counters and a heap of other ‘features’. Eris provides a fresh alternative. You wont find lots of different layout variations here but there are plenty of sensible options to allow you to tweak your theme. You can make your portfolio look different by choosing between a 3 column, 4 column or ‘shuffle’ layout which displays your work in a more unique way by breaking out of the traditional grid you usually find in portfolios. You can also choose between a couple of different menus and 3 different portfolio page layouts. You can also alter fonts to your heart content thanks to the 600+ Googlee fonts built in and you can make plenty of color changes too. I thoroughly recommend the Eris theme if you are looking for a WordPress portfolio theme but Eris would be perfect for agency websites too. 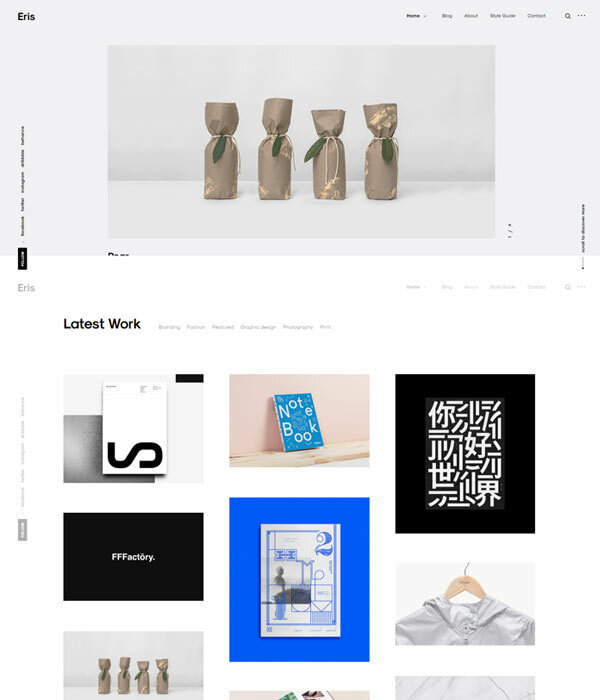 It really is one of the most elegant and effective portfolio themes available at the moment. Gorgeous theme. I think I’m going to have to get myself a copy for my portfolio.